The electricity that Howell-Oregon Electric Cooperative distributes to the homes and businesses of its members comes from Associated Electric Cooperative, Inc. (AECI). 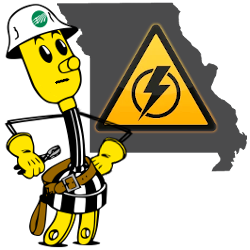 AECI was formed in 1962 in Springfield, Missouri, to generate the wholesale power supply of all of Missouri's distribution cooperatives. AECI uses a diverse mix of resources, including renewable sources of energy, to produce the clean, affordable and reliable power we all use. 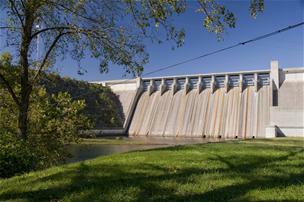 Hydropower from federal dams in Missouri, Oklahoma and Arkansas is a major renewable generating resource AECI uses to supply electricity for members. As hydropower is the least expensive resource it is used first, but it is a limited commodity dependent on rainfall and the capacity of lakes and dams to store the water. 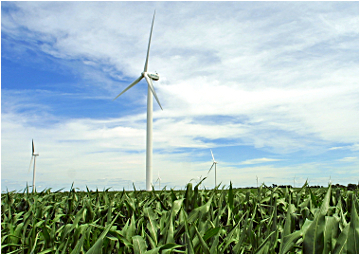 AECI has signed long-term agreements to purchase all of the wind power from four large wind farms in northern Missouri and, more recently, signed additional agreements to purchase large portions of the power generated by two farms located in Kansas and Oklahoma, bringing its total wind energy portfolio to 750 megawatts. The Bluegrass Ridge wind farm, located in Gentry County, MO, is pictured at right. The infographic pictured below provides details of the sizes and power-producing capacities of all six of the wind farms that AECI has power contracts with. AECI generates the base load portion of your electricity from two coal fired plants, Thomas Hill and New Madrid. Thomas Hill (shown at right) is near Moberly, Missouri, and has three generating units with a combined capacity of 1150 megawatts. 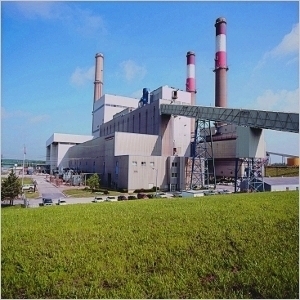 The New Madrid plant has two generating units with a combined capacity of 1200 megawatts. Both Thomas Hill and New Madrid were converted to burn low-sulfur coal in 1994. Since demand for power is increasing, Associated also uses three efficient, low-emissions natural gas plants to generate intermediate power as well as four peaking plants to meet the increased demand for electricity during peak high-use periods on the coldest winter and warmest summer days. All combined, AECI's use of low-sulfur coal, natural gas, hydro power and wind power makes for a very diversified mix of reliable generation sources for the electricity that HOEC distributes to you.